Because you've been waiting so patiently for it, here's the aforementioned sock: Meet L'Amour et La Morte, (what will eventually be) my latest sock-pattern-in-the-works. It shares its name with a song by The Real Tuesday Weld, whose music I have been much taken with as of late. 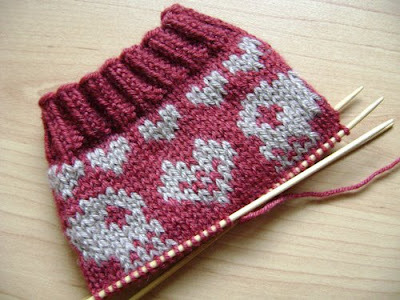 Keep an eye out for more pictures of the sock soon, since after this initial burst of colourwork it's going to change gears somewhat. Exciting, no? July 1, 2009 at 6:37 p.m. I thought the owls were great... but these are very, very cool! July 3, 2009 at 2:20 a.m.